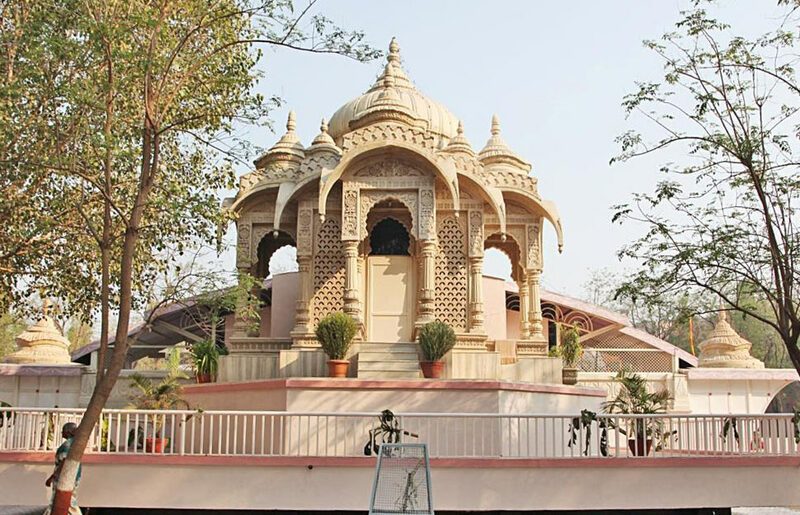 In the first branch of Shri Sansthan at Shri Khetra Pandharpur, the beautiful temple of Shri Gajanan Maharaj is built in marble stones in 8.5 acres of land where Shree Sansthan had the PranPratishtha of Shree's idol (with all religious rituals). Here the grand Mahadwar (Entrunce gate) 72 feet high and 51 feet wide built in Dholpuri stone attracts the devotees. 1) 5 Bhakt Niwas coplex with 252 rooms. 2) Homeopathy clinic with medicines. 6) Mobile Dispensary for week (during Ashadhi & Kartiki Ekadashi Utsav) about 20 to 25 Thousand devotees facilited yearly. 8) Mahaprasad distribution to 3 to 4 lakh devotees for Three days during Ashadhi and Kartiki Ekadashi Utsav. 9) Breakfast, Lunch & Dinner facility and Sabudana Khichadi, Bhagar, Aamati& Banana distributed at Ekadhashi moment. 10) Free of cost food (Rice and Kadhi) for devotees reaching, very late. (Timings 10.00 pm. to 1.00 am) at Sansthan's branch. 11) Pravachan, Bhajan and Kirtan during four months of Chaturmas. 12) Madhukari (Food) to 500 needy people during Chaturmas. During Ashadhi and Kartiki Ekadashi Shri Sansthan distributes Bhajani Sahitya to Bhajani Dindies coming from different rural areas who fulfil all the rules with necessary documents. Until date 2,074 villages have been distributed Bhajaji Sahitya by Sansthan at Pandharpur branch. These Bhajani Dindies coming from Districts like - Nagpur, Hingoli, Nanded, Parbhani, Beed, Ahemadnagar, Aurangabad, Jalna. Dhule, Nandurbar, Nashik, Thane, Mumbai, Pune, Satara, Sangli, Raigad, Ratnagiri, Sindhudurga, Latur, Osmanabad, Solapur, Kolhapur (Maharastra); Nijamabad, Bagalkot, Belgaon, Vijapur, Gadag, Koppal, Sumoga, Dawangiri, Haveri, Dharwad, Chikmangrul, Karwar, Billari, Tumkar, Ovhar, Bidar (Karnatak), Burhanpur (M.P. ), Adilabad(A.P.). Shri Sansthan distributed Bhajani Sahitya at free of cost including 10 pairs of cymbals- Tal jod, 1 Mrudung, 1 Venna to above all eligible Bhajani dindis with Saintly Literature Shri Dnyaneshwari, Shri Ekanathi Bhagawat and Shri Tukaram Gatha. By checking documents through computers one day before Ashadi ekadashi or Kartiki ekadashi bhajani sahitya is distributed on day of Ashadi ekadashi or Kartiki ekadashi on alredy decided time. In Shree's temple at Shri Kshetra Pandharpur, Puja, Aarati is performed with all rituals and Naivedya is offered. Sweets are distributed to 10 to 15 thousant devotees at Shri Kshetra Pandharpur Branch on the important festivals of Shri Sansthan. During Ashadhi and Kartiki Wari, Shri Sansthan distributes Mahaprasad for six days and around 4 to 5 lakh devotees rush at Shree's Temple.